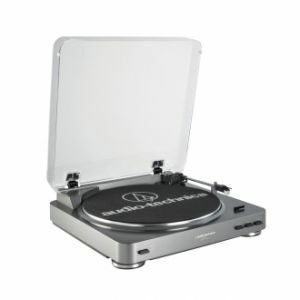 Audio Technica Fully Automatic Stereo turntabWith the Audio-Technica AT-PL60 Fully-Automatic Stereo Turntable System you can rediscover your classic 33-1/3 and 45RPM records on this affordable, fully automatic belt-drive workhorse. With its built-in switchablephono preamp, the AT-PL60 may be connected directly to your computer, home stereo and to other components that have no dedicated turntable input. Theturntable is supplied with an integral Audio-Technica Dual Magnet phono cartridge with replaceable stylus.